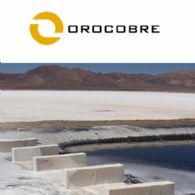 Orocobre Limited is listed on the Australian Securities Exchange and Toronto Stock Exchange ( ASX:ORE) ( TSE:ORL) (OTCMKTS:OROCF), and is building a substantial Argentinian-based industrial minerals company through the construction and operation of its portfolio of lithium, potash and boron projects and facilities in the Puna region of northern Argentina. 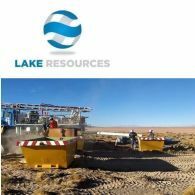 The Company has built, in partnership with Toyota Tsusho Corporation and JEMSE, the first large-scale, greenfield brine based lithium project in 20 years at the Salar de Olaroz with planned production of 17,500 tonnes per annum of low-cost battery grade lithium carbonate. 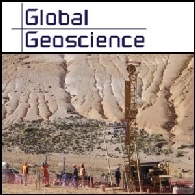 Global Geoscience Limited (ASX:GSC) is pleased to provide the Company&apos;s Quarterly Activities Report - March 2017. 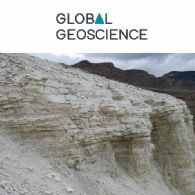 Global Geoscience Limited (ASX:GSC) is pleased to announce the appointment of Mr James D. Calaway as non-executive Chairman effectively immediately. 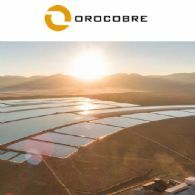 Orocobre Limited (ASX:ORE) (TSE:ORL) (OTCMKTS:OROCF) is pleased to advice that Sales de Jujuy S.A., the operating company of the Olaroz Lithium Facility, has now paid the six monthly principal and interest payment of US$13.9m due under its project financing facility. Orocobre Limited (ASX:ORE) (TSE:ORL) (OTCMKTS:OROCF) is pleased to provide the Company&apos;s latest presentation on Half Year Results 2017 and Strategic Update. Orocobre Limited (ASX:ORE) (TSE:ORL) (OTCMKTS:OROCF) (Orocobre), a leading producer of lithium carbonate, today released its financial results for the half year to 31 December 2016. Orocobre Limited (ASX:ORE) (TSE:ORL) (OTCMKTS:OROCF) (Orocobre or the Company) will release 2017 Half Year Financial results on Tuesday 28 February 2017. 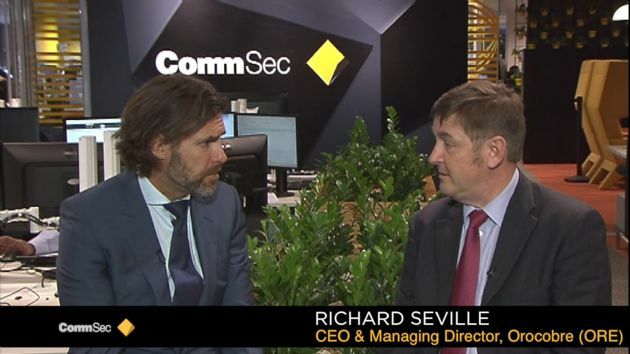 Managing Director, Mr Richard Seville will conduct a briefing with analysts and institutional investors at 11.00am AEDT (10.00am AEST). A live audio webcast of this briefing will be available on Orocobre&apos;s website at www.orocobre.com. Orocobre Limited (ASX:ORE) (TSE:ORL) (OTCMKTS:OROCF) Quarterly Report of Operations for the Period Ended 31 December 2016. Orocobre Limited (ASX:ORE) (TSE:ORL) (OTCMKTS:OROCF) provides the following update into studies conducted for the Stage 2 expansion of the Olaroz Lithium Facility. 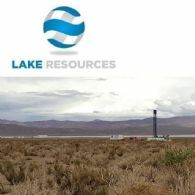 Orocobre Limited (ASX:ORE) (TSE:ORL) (Orocobre or the Company) today announced that it will divest a number of lithium brine exploration projects which are currently held through Orocobre&apos;s Argentine subsidiary South American Salars SA (SAS) to Canada&apos;s Advantage Lithium Corp. (CVE:AAL) (Advantage Lithium). 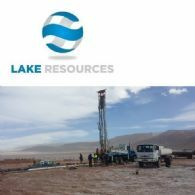 In conjunction with announcement of the joint venture (JV) between Orocobre Limited (ASX:ORE) (TSX:ORL) (the Company or Orocobre) and Advantage Lithium Corp. (CVE:AAL) (Advantage Lithium) on the Cauchari project ("Cauchari") in Jujuy Province, North West Argentina the company provides the following technical details. Orocobre Limited (ASX:ORE) (TSE:ORL) (OTCMKTS:OROCF) is pleased to provide the company&apos;s Annual General Meeting Presentation held on 23 November 2016. Orocobre Limited (ASX:ORE) (TSE:ORL) (OTCMKTS:OROCF) is pleased to provide the Chairman&apos;s Address to Shareholders at Annual General Meeting 2016. Orocobre Limited (ASX:ORE) (TSE:ORL) (OTCMKTS:OROCF) is pleased to provide the company&apos;s latest Corporate Presentation at UBS Conference. Orocobre Limited (ASX:ORE) (TSE:ORL) (OTCMKTS:OROCF) is pleased to provide the company&apos;s latest Quarterly Activities Report. Orocobre Limited (ASX:ORE) (TSE:ORL) (OTCMKTS:OROCF) is pleased to provide the Company&apos;s latest Annual Report to shareholders for 2016. Orocobre Limited (ASX:ORE) (TSE:ORL) (OTCMKTS:OROCF) is pleased to provide shareholders with an update on the Company and its projects, future direction and goals, the lithium market and current and future pricing. In accordance with Listing Rule 3.15.1, Orocobre Limited (ASX:ORE) (TSE:ORL) (OTCMKTS:OROCF) advises that its share register on the Toronto Stock Exchange will transfer to Computershare Investor Services Inc (Computershare) from TMX|TSX Trust Company effective close of business Friday 23 September 2016. Orocobre Limited (ASX:ORE) (TSE:ORL) (OTCMKTS:OROCF) advises that its share register will transfer to Computershare Investor Services Pty Limited (Computershare) from Boardroom Pty Limited effective close of business Friday 23 September 2016. Orocobre Limited (ASX:ORE) (TSE:ORL) (OTCMKTS:OROCF) (Orocobre or the Company) is pleased to announce the appointment of Australian commercial and finance executive, Ms Leanne Heywood to its Board of Directors effective today. Orocobre Limited (ASX:ORE) (TSE:ORL) (OTCMKTS:OROCF) is pleased to provide a Company presentation on the recent released Full Year Results. Orocobre Limited (ASX:ORE) (TSE:ORL) Established as Profitable, Low Cost Lithium Carbonate Producer. Orocobre Limited (ASX:ORE) (TSE:ORL) (OTCMKTS:OROCF) (Orocobre or the Company) today released its financial results for the 2016 financial year (FY16). 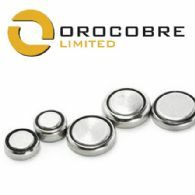 Orocobre Limited (ASX:ORE) (TSE:ORL) (OTCMKTS:OROCF) are pleased to provide the Company&apos;s Full Year Statutory Accounts. 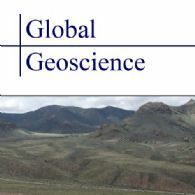 Global Geoscience Ltd (ASX:GSC) is pleased to announce the appointment of consulting engineers, Mr Silvio Bertolli and Mr Peter Ehren, to manage a program of processing and metallurgical test work and evaluation for the Rhyolite Ridge Lithium-Boron Project in Nevada, USA. Orocobre Limited (ASX:ORE) (TSE:ORL) (OTCMKTS:OROCF) (Orocobre or the Company) will release 2016 Financial Year results on Monday 19 September 2016. Managing Director, Mr Richard Seville will conduct a briefing with analysts and institutional investors at 11.00am. A live audio webcast of this briefing will be available on Orocobre&apos;s website at www.orocobre.com. Orocobre Limited (ASX:ORE) (TSE:ORL) (OTCMKTS:OROCF) are pleased to provide a corporate presentation to the Melbourne Mining Club. Orocobre Limited (ASX:ORE) (TSE:ORL) (OTCMKTS:OROCF) are pleased to provide the Company&apos;s quartlerly activities and cashflow report for the period ending June 2016. 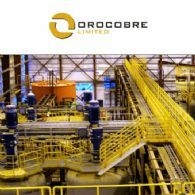 Orocobre Limited (ASX:ORE) (TSE:ORL) (OTCMKTS:OROCF) wishes to advise that Mr. James Calaway has resigned as a Director and Chairman of the Board of Directors of Orocobre. 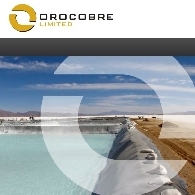 Orocobre Limited (ASX:ORE) (TSE:ORL) (OTCMKTS:OROCF) (Orocobre or the Company) wishes to advise on progress of production upgrade activities at the Borax Argentina borax decahydrate plant at Tincalayu. Orocobre Limited (ASX:ORE) (TSE:ORL) (Orocobre or the Company) is delighted to welcome Mr Alex Losada to the role of General Manager of Operations. Alex will be responsible for overseeing the operations of both the Olaroz Lithium Facility and Borax Argentina SA. 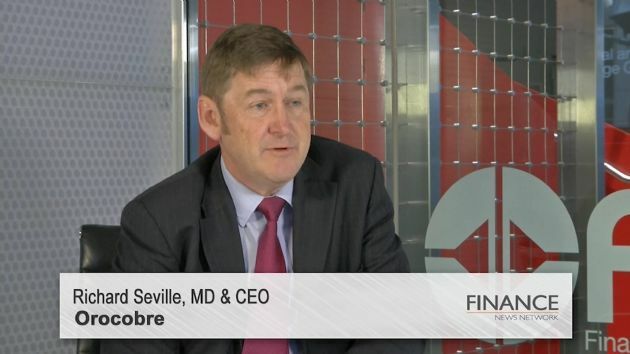 Orocobre Limited (ASX:ORE) (TSE:ORL) has released a webcast with the following details: Orocobre CEO, Richard Seville, discusses the Company, ramp up, the lithium market and the importance of lithium, customers and immediate and future objectives. Orocobre Limited (ASX:ORE) (TSE:ORL) (Orocobre or the Company) wishes to advise that the attached presentation will be used by the Company Chairman James Calaway at the Industrial Minerals 8th Lithium Supply & Markets Conference in Las Vegas USA. Orocobre Limited (ORE:ASX) (TSE:ORL) wishes to advise that the attached presentation will be used by the Company for investor road shows taking place in Singapore and Hong Kong in April. Orocobre Limited (ASX:ORE) (TSE:ORL) are pleased to provide the Company&apos;s quarterly report of activities for the period ended 31 March 2016. Orocobre Limited (ASX:ORE) (TES:ORL) (Orocobre or the Company) wishes to advise on production for Q1 2016 at the Olaroz Lithium Facility. Orocobre Limited (ASX:ORE) (TSE:ORL) (OTCMKTS:OROCF) wishes to advise on production for February at the Olaroz Lithium Facility. 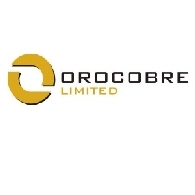 Orocobre Limited (ASX:ORE) (TSE:ORL) (OTCMKTS:OROCF) (Orocobre or the Company) is releasing the half year results for the period July-December 2015. 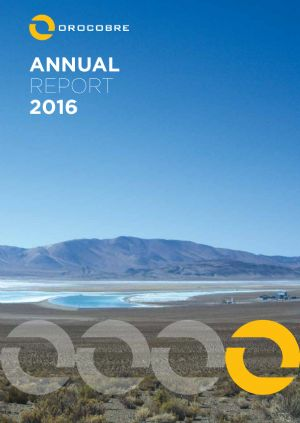 Production at the Olaroz Lithium Facility continued to increase in January, with 699 tonnes of lithium carbonate produced, an increase of 272 tonnes on December. Included in the 699 tonnes produced in January is 80 tonnes recovered from within the purification circuit. Orocobre Limited (ASX:ORE) (TSE:ORL) ("Orocobre" or "the Company") issued 25,350,551 ordinary shares in the Company to institutional and sophisticated investors on 1 February 2015, as outlined in the Company&apos;s announcement of 22 January 2016. Orocobre Limited (ASX:ORE) (TSE:ORL) (OTCMKTS:OROCF) (Orocobre or the Company) is pleased to announce it has raised A$85,000,000 through a placement (the Placement) of 40,476,190 shares to domestic and international institutional and sophisticated investors at an issue price of $2.10 per share, representing a 10.7% discount to the 5 day VWAP of the Company&apos;s shares prior to the Company entering into a trading halt on 20 January 2016. In accordance with Listing Rule 17.1 Orocobre Limited (ASX:ORE) (TSE:ORL) requests a trading halt be applied to all of its quoted securities. 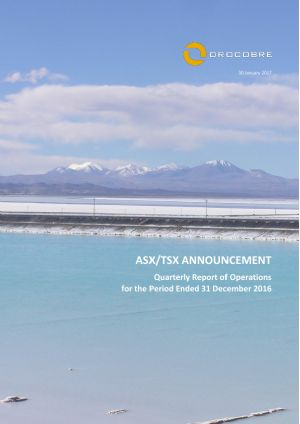 Production at the Olaroz Lithium Facility continued to increase in December with 427 tonnes of lithium carbonate produced, an increase of 62 tonnes on November, with production rates of 20 tonnes per day (tpd) being achieved towards the end of the month. Of the total tonnes produced 65 tonnes were recovered from within the purification circuit. Orocobre Limited (ASX:ORE) (TSE:ORL) wishes to provide guidance on the impact of changes in Argentine Government policy on its business operations in Argentina. Orocobre Limited (ASX:ORE) (TSE:ORL) Response to ASX Price Query. Orocobre Limited (ASX:ORE) (TSE:ORL) (Orocobre or the Company) wishes to advise on progress at the Olaroz Lithium Facility. Orocobre Limited (ASX:ORE) (TSE:ORL) advises that the attached presentation will be used by Company management for an investor roadshow taking place in Melbourne and Sydney. 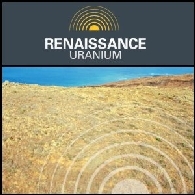 Orocobre Limited, (ASX:ORE) (TSE:ORL) is pleased to announce that it has entered into a Memorandum of Understanding (MOU) with Bateman Advanced Technologies (BAT), a subsidiary of Tenova S.p.A, a worldwide supplier of advanced technologies, products and engineering services. Orocobre Limited (ASX:ORE) (TSE:ORL) wishes to advise on production for October at the Olaroz Lithium Facility. Production continued to rise in October with 316 tonnes of lithium carbonate produced versus a forecast of 300 tonnes. The Olaroz Lithium Facility is Orocobre Limited&apos;s (ASX:ORE) (TSE:ORL) flagship project located in the Jujuy province of Argentina. Together with partners, Toyota Tsusho Corporation (TTC) and Jujuy Energia y Mineria Sociedad del Estado (JEMSE), Orocobre is now operating the first large scale lithium brine plant commissioned in approximately 20 years. Orocobre Limited (ASX:ORE) (TSE:ORL) wishes to advise on progress at the Olaroz Lithium Facility. Orocobre Limited (ASX:ORE) (TSE:ORL) are pleased to provide the Company Annual Report to shareholders for the period ended June 2015. 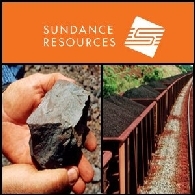 Please find attached the Corporate Governance Statement for Orocobre Limited (ASX:ORE) (TSE:ORL) for the financial year ended 30 June 2015, together with an Appendix 4G Key to Disclosures - Corporate Governance Council Principles and Recommendations. 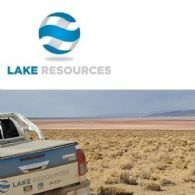 Orocobre Limited (ASX:ORE) (TSE:ORL) wishes to advise on progress at the Olaroz Lithium Facility, highlights include: lithium carbonate production ramp up continues, production planned for September is 250 tonnes; Work continuing on removing bottlenecks and improving operating practice; FMC Corporation (NYSE:FMC) announces a 15% price increase for lithium products. Orocobre Limited (ASX:ORE) (TSE:ORL) are pleased to provide the company&apos;s quarterly report of operations and cashflow for the period ended 30 June 2015. Orocobre Limited (ASX:ORE) (TSE:ORL) are pleased to provide a company presentation and investor update regarding its operations and project updates, including its Olaroz facility and operations update, lithium market update and Borax Argentina projects. Orocobre Limited (ASX:ORE) (TSE:ORL) wishes to announce that it has raised A$32.3 million through a Placement to both domestic and international institutional and sophisticated investors. 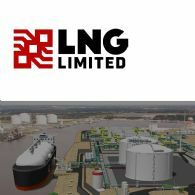 The raising was significantly oversubscribed, with support shown by both existing and new shareholders. Orocobre Limited (ASX:ORE) TSE:ORL) (the Company) - Request for Trading Halt. In accordance with Listing Rule 17.1 the Company requests a trading halt be applied to all of its quoted securities. Orocobre Limited (ASX:ORE) (TSE:ORL) (OTCMKTS:OROCF) wishes to advise on progress at the Olaroz Lithium Facility. The lithium carbonate plant continues to produce both battery grade and technical grade lithium carbonate to fulfil sample and customer order requirements. 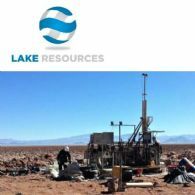 The Olaroz Lithium Facility is Orocobre Limited&apos;s (ASX:ORE) (TSE:ORL) flagship project located in the Jujuy province of Argentina. Together with partners, Toyota Tsusho Corporation (TTC) and Jujuy Energia y Mineria Sociedad del Estado (JEMSE), Orocobre is now operating the first large scale "green fields" lithium brine project in approximately 20 years. Orocobre Limited (ASX:ORE) (TSE:ORL) wishes to advise on the Olaroz Lithium Facility&apos;s transition from commissioning into early operations and commercial production. Orocobre Limited (ASX:ORE) (TSE:ORL) advises that the presentation released 2 April 2015 is being re-released with the resource statements included and the clarification statement in relation to the exploration target added to slide 17. Orocobre Limited (ASX:ORE) (TSE:ORL) advises that the company will be presenting to the Sydney Mining Club in Sydney. Orocobre Limited (ASX:ORE) (TSE:ORL) ("Orocobre" or "the Company") wishes to announce that all resolutions were passed as ordinary resolutions on a show of hands. Orocobre Limited (ASX:ORE) (TSE:ORL) advises in accordance with Listing Rule 3.16 that Rick Anthon has been appointed Joint Company Secretary, alongside existing Company Secretary and Chief Financial Officer Mr Neil Kaplan. 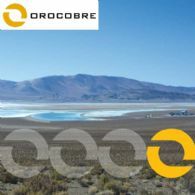 Orocobre Limited&apos;s (ASX:ORE) Olaroz Project Joint Venture is operated through Sales de Jujuy S.A. (SDJ SA) a subsidiary of Sales de Jujuy PTE, a Singaporean company that both Orocobre and Toyota Tsusho Corporation (TTC) respectively, are shareholders in directly and indirectly. The Company advises that due to a typographical error the resolution should seek approval for the issue of 15,318,712 shares. Orocobre Limited (ASX:ORE) (TSE:ORL) is pleased to offer existing shareholders the opportunity to participate in a $15,000,000 Share Purchase Plan (the Offer) to acquire additional shares at an Issue Price of $2.55 per share. Orocobre Limited (ASX:ORE) (TSE:ORL) advise that notice is given that a General Meeting of Shareholders of Orocobre Limited (Company) will be held at Level 1, 349 Coronation Drive, Milton, Brisbane, Queensland, Australia 4064 on 16 March, 2015 commencing at 10:00 a.m. (Brisbane time). Orocobre Limited (ASX:ORE) (TSE:ORL) is pleased to announce it has raised approximately A$50 million through a $40m Placement to domestic and international institutional and sophisticated investors and a $10m underwritten Share Purchase Plan. Orocobre Limited (ASX:ORE) (TSE:ORL) is pleased to announce that the final circuits of the Olaroz lithium plant have been commissioned and the plant has now moved into commercial production ramp-up stage. Orocobre Limited (ASX:ORE) (TSE:ORL) is pleased to announce that the official opening ceremony of the Olaroz Lithium Project was held on site at Olaroz on December 3, 2014. Orocobre Limited (ASX:ORE) (TSE:ORL) is pleased to announce that the Argentine mining magazine Panorama Minero and the Fundacion para el desarrollo de la Mineria Argentina ("Fundamin or Foundation for Development of Argentina Mining) named Orocobre Group&apos;s subsidiary Sales de Jujuy SA as "Mining Company of the Year 2014". Orocobre Limited (ASX:ORE) (TSE:ORL) provides the latest Company Presentation regarding the flagship Olaroz lithium project approaching production. Orocobre Limited (ASX:ORE) (TSE:ORL) is pleased to announce the upgrade of a historical estimate to an Indicated and Inferred Resource for the Tincalayu borate mine in Salta Province, Argentina. This mine is located on the Tincalayu Peninsula, adjacent to the Hombre Muerto salar, within 17 mining leases owned by the 100% Orocobre subsidiary Borax Argentina. Orocobre Limited (ASX:ORE) (TSE:ORL) is pleased to advise progress regarding the quantification of additional lithium brine within the Olaroz salar that may contribute to additional expanded production at a lower brine supply development cost than the current phase 1 development. Orocobre Limited (ASX:ORE) (TSE:ORL) is pleased to advise progress on the construction and commissioning at its flagship Olaroz Lithium Project. In terms of physical progress the construction program is nearing completion with the commissioning of lithium carbonate plant circuits occurring as they are released from construction. The project is expected to be completed on budget. Orocobre Limited (ASX:ORE) (TSE:ORL) provides the presentation to be used by Company management at the Canaccord 8th Annual Global Resources Conference held in New York and at investor road shows across North America over the coming weeks. 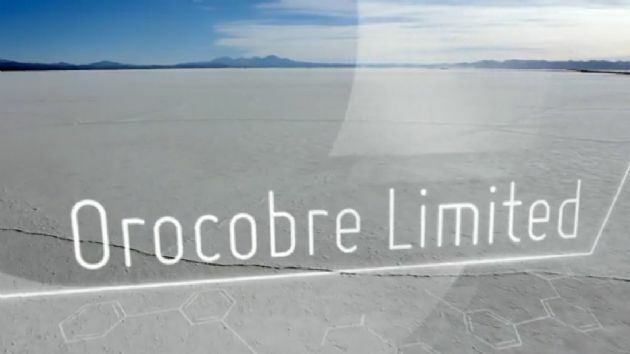 Orocobre Limited (ASX:ORE) (TSE:ORL) is building a substantial industrial chemicals and minerals company through the construction and operation of its portfolio of lithium, potash and boron projects in the Puna region of northern Argentina. Orocobre Limited (ASX:ORE) (TSE:ORL) is pleased to advise progress on the construction and commissioning at its flagship Olaroz Lithium Project. In terms of physical progress the construction program is now nearing completion with the commissioning of circuits occurring as they are released from construction. The project is expected to be completed on budget. Orocobre Limited (ASX:ORE) (TSE:ORL) is pleased to announce that the committee of Argentina Mining has recognised Orocobre Group with an award for 2014&apos;s "Outstanding CSR Mining Company". Orocobre Limited (ASX:ORE) (TSE:ORL) is pleased to advise progress on the construction of its flagship Olaroz Lithium Project. In terms of physical progress the construction program is now approximately 95% complete. Orocobre Limited (ASX:ORE) (TSE:ORL) provide the Quarterly Activities & Cashflow Report for the period ending June 2014 with significant highlights. Orocobre Limited (ASX:ORE) (TSE:ORL) is pleased to advise the relocation of Borax Argentina&apos;s borax decahydrate chemical plant from Campo Quijano to Tincalayu mine site has been completed within budget and production has commenced. 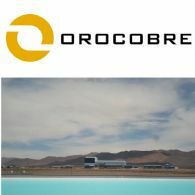 Orocobre Limited (ASX:ORE) (OTCMKTS:OROCF) advises that a number of unlisted options have lapsed in accordance with the terms of their grant. Orocobre Limited (ASX:ORE) (TSE:ORL) (OTCMKTS:OROCF) provides the latest presentation to be used by Company management on investor road shows to Hong Kong, Singapore and London over the next two weeks. Orocobre Limited (ASX:ORE) (TSE:ORL) (OTCMKTS:OROCF) is pleased to advise progress on construction of its flagship Olaroz Lithium Project. In terms of physical progress the construction program is now approximately 93% complete. A total of approximately US$214m has been spent or committed via executed contracts in the construction project to date. The project is expected to be completed on budget. 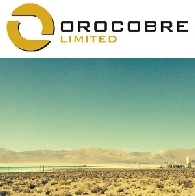 Orocobre Limited (ASX:ORE) (TSE:ORL) wishes to issue an update in response to recent shareholder enquiries regarding the replacement of pumps at the TK-200 transfer ponds to increase brine supply from the southern bore field as detailed in Construction Update on the Olaroz Lithium Project (09 April 2014). Orocobre Limited (ASX:ORE) (TSE:ORL) BRR Media Webcast - Porvenir, Boric Acid PFS & Olaroz. Richard Seville discusses the upgrade of the Porvenir resource, the boric acid PFS and Olaroz construction. 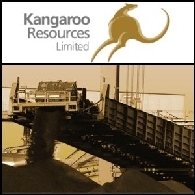 Orocobre Limited (ASX:ORE) (TSE:ORL) provides the presentation to be given by Chairman James Calaway to institutional investors and brokers in North America during the period of 5-8 May 2014. 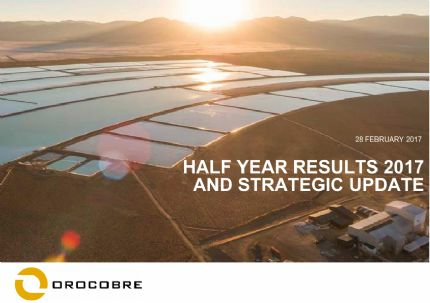 Orocobre Limited (ASX:ORE) is about to announce its quarterly activities and cashflow report for period ending March 2014. Orocobre Ltd (ASX:ORE) (TSE:ORL) is pleased to announce the results of a Pre-Feasibility Study ("PFS") on the development of a 25,000 tpa boric acid plant at Olacapato in NW Argentina ("Olacapato Project"). Orocobre Limited (ASX:ORE) (TSE:ORL) provide the latest Company Presentation regarding the Flagship Olaroz lithium project under construction in Argentina. Orocobre Limited (ASX:ORE) (TSE:ORL) ("Orocobre" or "the Company") is pleased to advise progress on construction of the flagship Olaroz Lithium Project. In terms of physical progress the construction program is approximately 85% complete. A total of approximately US$194m has been spent or committed via executed contracts in the construction project to date. Orocobre Limited (ASX:ORE) (TSE:ORL) is pleased to announce the upgrade of a historical estimate to a Measured and Indicated Resource for the Porvenir borate deposit in Jujuy Province, Argentina. 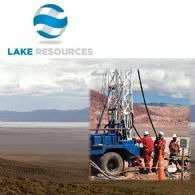 The resource is located in the Cauchari salar, within 39 mining leases owned by the 100% Orocobre subsidiary Borax Argentina. Orocobre Limited (ASX:ORE) (TSE:ORL) ("Orocobre" or "the Company") is pleased to advise progress on the relocation of the borax chemical plant. Orocobre Limited (ASX:ORE) (TSE:ORL) ("Orocobre" or "the Company") is pleased to advise progress on construction of the flagship Olaroz Lithium Project. 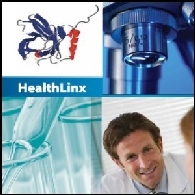 Asian Activities Report for September 9, 2011 includes: HealthLinx Limited (ASX:HTX) is to begin a 350 patient academic study as the first step to launch the OvPlex(TM) ovarian cancer diagnostic in China; Amex Resources Limited (ASX:AXZ) today provided an update on the Company&apos;s recent advancements on the MBa Delta Ironsands Project in Fiji; Orocobre Limited (ASX:ORE) has received approval to drill exploratory wells on its Cauchari Project in Argentina; Coalbank Limited (ASX:CBQ) has engaged an independent technical expert to review its metals projects portfolio. Australian Market Report of November 5, 2010 includes: Sundance Resources Limited (ASX:SDL) has appointed CITIC Securities Company Limited (SHA:600030) to assist in securing both debt and equity funding in China for its Mbalam Iron Ore Project; Orocobre Limited (ASX:ORE) has commenced an initial drilling program at its Salinas Grandes Lithium-Potash Project in North West Argentina; Beadell Resources Limited (ASX:BDR) reported high grade results from the Tucano Gold Project in Brazil; Horseshoe Metals Limited (ASX:HOR) announced more positive drilling results at the Horseshoe Lights copper and gold project in Western Australia.